Bramblecrest Chichester 3m Cantilever Round Parasol - provides high quality outdoor protection from the Sun benefiting from a foot pedal operated easy canopy rotation, plus a backward tilt function. 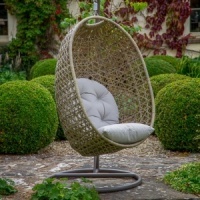 Easy to use crank handle raises the natural coloured canopy. Powder coated aluminium pole and steel base frame. Canopy is vented and water resistant. Requires sectional base weights. *not supplied (available separately). Set includes protective parasol cover. Brilliant piece of kit. 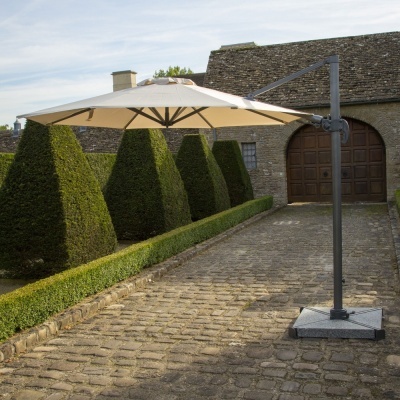 Easy to assemble, so many options for positioning the parasol, robust, well made and effective. Fantastic service from Bosworths as well - ordered a.m., delivered p.m. same day. Outstanding.